I'm thinking of the combination of ribbons for this panda. It's not s hard to make the pleated ribbon, but it's difficult to think the combination. This will be for my son, but I'm going to make more for my ETSY shop. 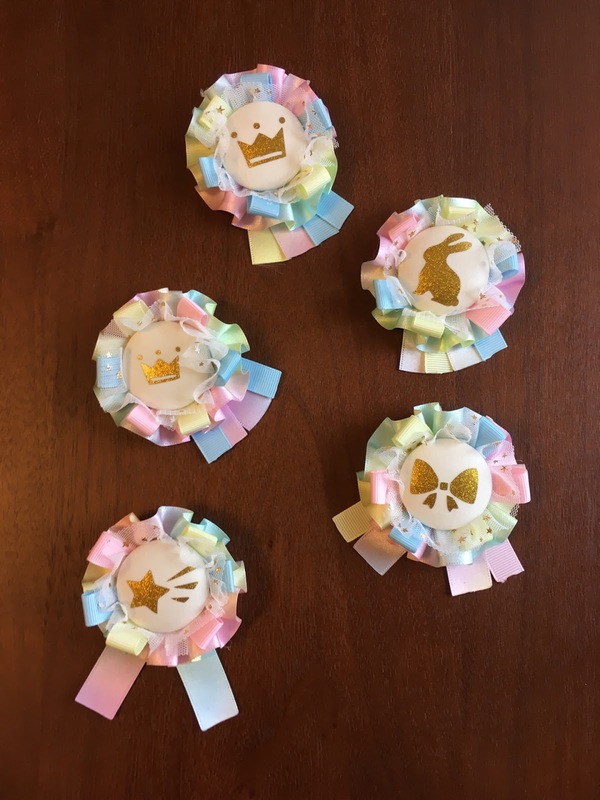 Rosettes are very popular in Japan now, mostly for wedding items, also as brooches or bag charms. A couple of months ago, I began to give lessons of rosette making with my friends. It's very fun and I enjoy making them every day. Now I like making ones with denim ribbons. We'll give lessons for girls two weeks later. Miyu also enjoyed making one as a sample. Rosettes of this picture are what Miyu and her friends made as samples. Most of skirts and dresses have no pockets. But my daughter needs a pocket for a handkerchief. Many kids in Japan have clip-on pockets but she doesn't like them because of the hard and disturbing clips. So I made a sew-on pocket for her. I put 2 tabs to sew easily on her skirt. She likes it very much and I'll make more for other skirts.